The second installment of the Battle of Hudson went to the Devils. They can thank Cory Schneider, who made 31 saves to give Jersey’s team a well earned 3-2 win over the Rangers before 16,514 at The Prudential Center. They did it in come from behind fashion on third period goals from Joseph Blandisi and David Schlemko stunning their close Big Apple rivals to close within two points in the standings. With the Pens also winning, the Devils kept pace with 57 points. They still are on the outside of the wildcard due having played two more games than Pittsburgh. But they’re right there. With the Islanders prevailing over the Wild, they pulled within a point of the Rangers for second place with 58 points. The loss may have been costly for the Blueshirts, who saw defenseman Kevin Klein leave the game late with a injury on an unpenalized Reid Boucher hit into the boards. Even though it was only the second meeting of the season and first since a Devil shootout win over the Rangers at MSG on Oct. 18 due to ridiculous scheduling, it was a good game. The Devils turned over pucks plenty in the first period. That forced Schneider to be at his best. He made some strong denials early keeping it scoreless. A bad pinch from Eric Gelinas resulted in the game’s first goal scored by J.T. Miller. The confusing Devil defenseman got caught deep with Jesper Fast firing out of the zone to spring Derick Brassard and Miller on a 2-on-1 break. Brassard patiently waited before sliding the puck across for Miller who buried his 14th at 13:31. It was the only goal of the period allowing the Rangers to take a one-goal lead to the locker room. There was one problem. A lazy penalty from Derek Stepan with under six seconds left in the first wound up hurting them. He took a bad hooking minor in the offensive zone. After the Devils didn’t score at the end of the period, they still had 1:54 to work with at the start of the second. For a while, it looked like the Rangers would kill it. But a coverage breakdown between Marc Staal and Klein allowed a wide open Lee Stempniak to steer home a rebound of a low Gelinas’ shot past Henrik Lundqvist at 1:34 to tie it. Adam Henrique set it up. Rangers coach Alain Vigneault made a mistake challenging the goal for “goalie interference.” To his credit, Stempniak was parked right in front of Lundqvist, who was out at the edge of his crease. He never made contact impeding Lundqvist’s ability to stop the shot. Honestly, it was just a brutal challenge that would come back to haunt Vigneault’s team later because it cost him his timeout. The goal was properly ruled as called by refs Dean Morton and Tim Peel. Following Stempniak’s 15th goal, the Devils played a stronger second. They were more noticeable on the forecheck. Especially the pesky fourth line featuring Bobby Farnham and birthday boy Jordin Tootoo. Farnham was a pest during a couple of shifts. On one, he bobbed his head up and down trying to draw a penalty. It’s not the most commendable thing to do which drew laughter from Tanner Glass. A small player, Farnham was effective on the cycle and even had a great chance point blank which Lundqvist denied with Tootoo just missing wide. The Rangers also had their chances firing 12 shots on Schneider. But he was razor sharp. A couple of notables included stopping Chris Kreider from in tight off a rush pushing his backhand deke attempt to the corner. Kreider was thwarted at least three times. He also had to contend with a blind giveaway from Gelinas right to attacking Blueshirt but was able to make the clutch save. The Devils were guilty several times of sloppy play. But Schneider was more than willing to cover for them. They ought to by him a steak dinner. A big difference in the game was special teams. A sore spot for the Rangers all winter, they failed miserably. That included two bad misses in the second with the game tied. Vigneault was unwilling to try Keith Yandle on a new top unit that featured four forwards and Ryan McDonagh. They were unable to generate much even giving up a couple of dangerous shorthanded chances. While they went 0-for-4, the Devils were a perfect 2-for-2 including Schlemko’s game-decider with 8:46 left in regulation. Entering the third, the game was anybody’s. The teams were still tied. 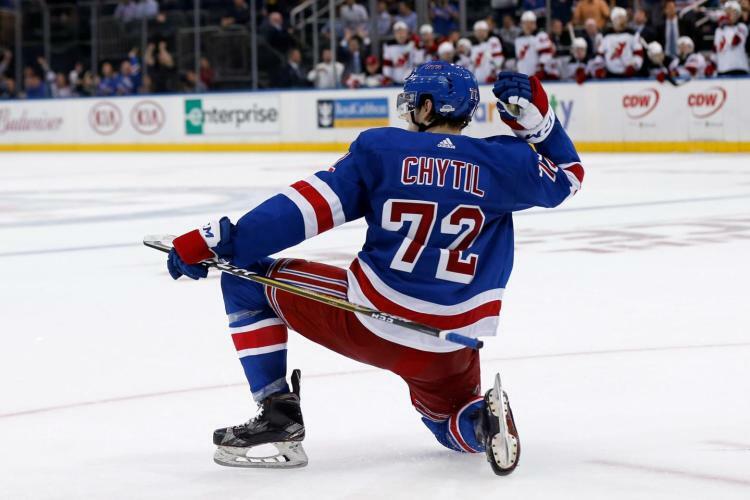 On a dominant shift following a Devil icing, Dan Boyle and Yandle combined to set up Miller, who was able to beat Schneider from a tough angle for his second of the game at 2:06 giving the Rangers their second lead. It was one Schneider should’ve had. He just got caught a little off angle and missed Miller’s shot with his glove. Miller has been the one consistent Blueshirt during a confusing time where they can’t put anything together. He now has 15 goals and is building a case for a nice contract as a restricted free agent this summer. One thing about these Devils. They never quit. Under the general as I refer to him coach John Hynes, they are relentless. Much like their team mantra on Twitter, it doesn’t matter if they’re badly outplayed for stretches. They find a way. Before the Rangers could even relax, Joseph Blandisi flew past three Rangers including Dan Girardi and Ryan McDonagh before whipping a nice wrist shot from the left circle past Lundqvist which allowed the Devils to respond 1:07 later. New Jersey captain Andy Greene made a smart play banking a pass off boards at center which allowed the faster Blandisi to utilize his speed and score his second NHL goal tying it at 3:13. Damon Severson drew the secondary helper. What followed was the Rangers searching for a way to beat Schneider. He wasn’t willing. As if to prove a point, Blandisi’s show was the Devs’ first of the third. It was mostly Blueshirts who led in shots 5-1 and wound up outshooting the Newark hosts 11-5. Throw the stats out the window. It didn’t matter. Instead, a Oscar Lindberg interference minor led directly to Schlemko’s winner. It almost didn’t happen. At the start of the power play, it was Schlemko who made a horrible giveaway at the point right to McDonagh, who had a clean shorthanded breakaway. But his shot missed its target going over the net. Inexplicable. Usually, when you fail on such chances, the opponent comes back and scores. That’s what happened. On another blown coverage, Schlemko was the recipient of a Stempniak feed at the doorstep sending a perfect one-timer past Lundqvist inside the goalpost. Tyler Kennedy started it with some good work in the corner. Dominic Moore got caught. Almost immediately, Boyle outskated Adam Larsson forcing him to take a holding minor. Considering that even when a weak call a period earlier on Kyle Palmieri for a phantom rough resulted in nothing, it wasn’t too startling that the Rangers didn’t get the game tied. Finally, Vigneault started Yandle. Fittingly, he turned the puck over at the start resulting in a clear. The rest of the power play got looks. But none got past Schneider, who wasn’t having it. The All-Star netminder made his case for the Vezina with a strong denial on Viktor Stalberg and giving Boyle nothing to shoot at. The Devils also prevailed because they were determined. A great shift with over a minute left pinned the Rangers deep. They even scrambled before pulling Lundqvist for an extra attacker. When McDonagh had the puck, he didn’t have much room to shoot and fired off a Devil out of play leaving one more face off. That typified the effort from the Devils, who did what they do. Find a way to win thanks to Schneider and timely scoring. A Travis Zajac faceoff win over Derick Brassard and a clear allowed them to congratulate their winning goalie. The game’s best player. I figured you’d do a recap too but I wanted to do one anyway. Sometimes it works better to get it from both sides, especially in tight meaningful games like tonight. I wouldn’t say the Rangers deserved to win as much as the Devils probably deserved to lose, but didn’t cause of Cory. I was gonna comment on the Klein thing, I think that was just unfortunate. A clean hit where he was already slipping along the boards. A lot of players were falling all over the ice tonight. He’s probably out for a while but I guess at least one of your kids gets another shot now. When I watch your team, what I love is their attitude. They never quit. They might get dominated during shifts. But there’s no give up. They fight. The Devils are the most exciting team of the 3 locals. It’s not always pretty. But they play a fun style. And the goalie deserves more of a look at that Vezina. Look what he has. On Klein, it could’ve been a penalty. It wasn’t called. Didn’t matter anyway. And as for the coach. He really screwed the pooch with that challenge.